The Titus EcoShield is a sustainable product comprised of recycled denim, which means it is environmentally friendly and contains no harmful irritants or chemicals. EcoShield also includes an EPA registered anti-microbial (biocide) mold and fungal inhibitor ensuring the product is safe for you and the environment. Additionally, EcoShield is a thermally bonded, high density insulation that meets all industry thermal and acoustic requirements. The roll sizes above are the standard stock sizes, with custom sizes being available between the maximum roll widths of 60” in lieu of the standard 48” width. We also have EcoShield sample kits, which are packaged in a box that can have up to 8 liner samples. A custom insert highlights competitive advantages. Contact Titus Marketing for demo kits. Quiet operation: Cotton has excellent sound-absorbing qualities, and EcoShield meets the same acoustical performance of the Titus line of fiberglass-lined products. Thermal protection: Outstanding insulation performance assists in conserving energy, without the potential health concerns associated with traditional fiberglass insulation. High air-erosion tolerance: EcoShield meets the same standards as fiberglass. ASTM C1071. Resists microbial growth: Treated with a patented EPA-approved fire retardant that limits fungus and mold growth. ASTM C1338, G21, and G22. Resists dirt, debris, damage, and moisture: The durable non-woven facing provides resistance to dust, dirt, debris, moisture, and is available with foil facing as well. No itch or skin irritation: Constructed of natural cotton fibers containing no harmful irritants and is safe to handle. Exceeds Class A – Flame/Smoke: Surpassed Class A standards of 25/50 with actual EcoShield results being 5/10. ASTM E84. Non-toxic: Patented fire-retardant treatment does not emit toxic fumes upon exposure to flame. The Ecoshield surface that is exposed to the air stream is overlaid with a durable, fire-resistant facing that also provides additional strength. The liner facing is not only available in the black matte facing, but in foil facing as well in both ½” and 1” thicknesses. 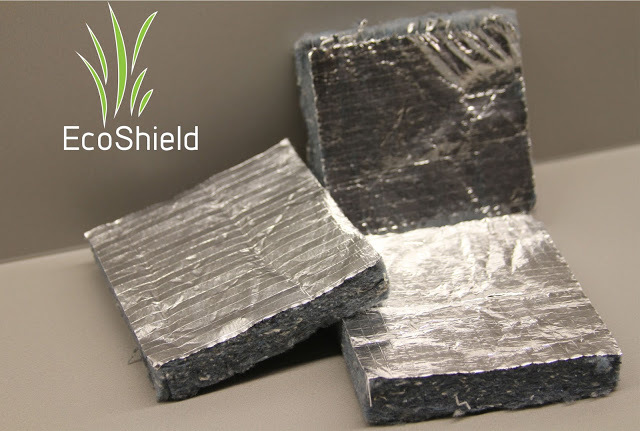 Ecoshield eliminates outgassing or Volatile Organic Compound (VOC) concerns, and includes an EPA registered anti-microbial biocide for mold and fungal inhibition that ensures the facing is safe for you and the environment. People have become more concerned about their IAQ when they have fiberglass in their HVAC systems. There has been a growing a trend toward eliminating fiberglass from the airstream. These liners remove fiberglass from the airstream, but there are financial/acoustical costs associated with them. Not having a liner would obviously be the least expensive of the options, but it would result in the highest acoustic penalty. Insulation is an excellent attenuator of HVAC sound. Fibre Free™ is the least expensive of the liner options, but would increase the sound of the system by approximately 2 to 3 dB in each octave band. SteriLoc™ covers the fiberglass fibers with foil scrim. They are a slightly higher cost alternative, but increase the sound of the system by approximately 4 to 6 dB in each octave band. There is also the potential that the foil scrim can get torn during installation, since it is a duct-board liner which is much denser and would expose the fiberglass to the airstream. UltraLoc™, which sandwiches the fiberglass fibers between sheet metal, is the most expensive of the liner options and by far the heaviest. The sound increase of a double-wall terminal is dependent on unit design and airflow characteristics. EcoShield™ allows you to take the fiberglass out of the airstream with no additional cost for the liner. The terminal casing shall be minimum 22-gauge galvanized steel (20 gauge for fan-powered terminals), internally lined with ½-inch matte faced, natural fiber insulation that complies with ASTM C 1071 and NFPA 90A. The liner shall comply with ASTM G21 and G22 for fungi and bacterial resistance.